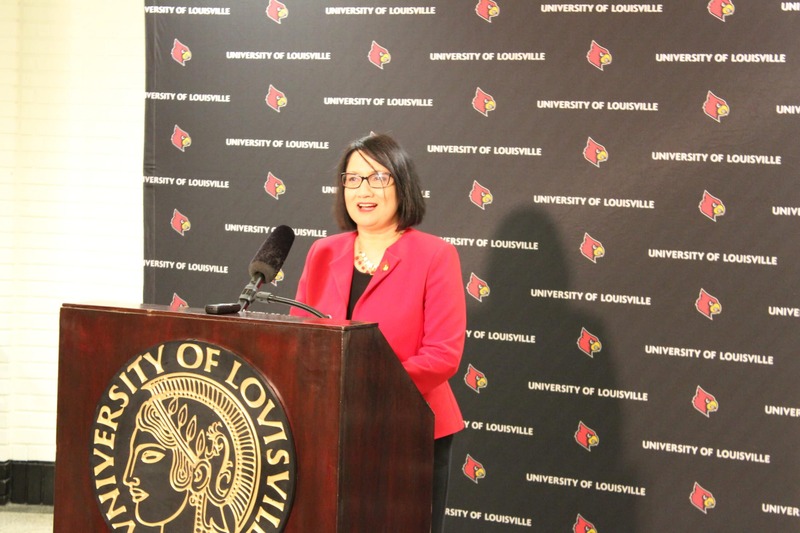 University of Louisville President Neeli Bendapudi formally launched her strategic plan in two three-year plans instead of a 10-year plan on Jan. 24 in the Student Activities Center Ballroom. “I’m nervous, but it’s a happy-excited nervous, ‘I can’t wait to see what we all do together’ type of nervous,” said Bendapudi. Bendapudi started the launch emphasizing that strategic plans for a university take more time to put together than 100-day plans at businesses. Bendapudi announced the plan will be in two three-year plan installments instead of a typical 10-year strategy. The first is scheduled for 2019-2022 and the second is 2022-2025. Bendapudi joked that neither she nor the university can hide with two three-year plans the same way someone could with a longer plan. “When we have 10-year strategy plans, it is easy to say it will all pull together in year nine,” she said. Gail DePuy, interim dean of Speed School and previous associate dean for Academic & Student Affairs was announced as a co-chair with Bendapudi. Chairman and endowed professor of Otolaryngology Dr. Jeff Bumpous was also named co-chair. Bendapudi maintains her three strategic goals as ensuring U of L is a great place to learn, work and invest. There will be a special committee focused on each goal. The committee structure includes an executive committee, steering committee and work groups. The executive committee will include individuals like Provost Beth Boehm and Student Government Association President Jonathan Fuller, along with eight other individuals and the three co-chairs. The executive committee will be managing the process and coordinating efforts of the other committees. The steering committee is charged with steering all work groups and appropriately communicating progress with campus. The steering committee will include a total of 22 individuals along with the three co-chairs and executive committee. The work groups will be split into three groups to focus on each of the three strategic goals. The group will include 20 to 30 individuals and will have three co-chairs, each in charge of a specific goal. The co-chairs will be decided by the executive committee.